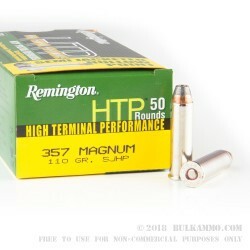 This 357 Mag cartridge by Remington features a 110 grain projectile, the lightest of the bullets commonly available in this caliber. That means it has a positively zippy muzzle velocity of 1,295 fps, at the trade-off of not having as much penetrating power as a heavier bullet would with its greater momentum. Its light weight also causes its hollow point to expand at a faster rate, however, translating into staggering and immediate damage. 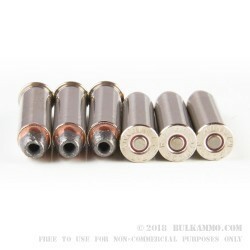 This cartridge’s bullet also sports a semi-jacket, giving it good penetrating characteristics without additionally hampering its expanding capabilities. In all, this is a great choice for self-defense, especially if you are able to quickly unload an entire cylinder into your target. This cartridge’s Boxer primed brass casing is fully reloadable, so you can get value from your purchase for many trips to the range to come. 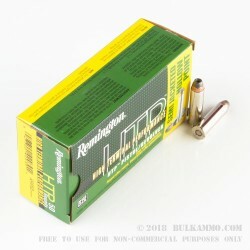 Remington has already got a reputation for excellence that spans over two decades -- they up the ante with their High Terminal Performance line of handgun ammunition, which boasts peerless reliability in situations where your safety is on the line. Got this for my brother for our range day, and, it performed very well. 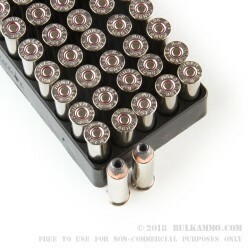 Q: What are the ballistics of this ammo? Ft/Sec, Ft.Lbs.